3. Explore the spirited Kentucky tradition of bourbon-making with free tours at Buffalo Trace, maker of Ancient Age (502-696-5926 or 800-654-8471). 4. 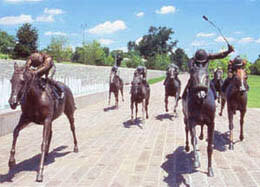 Snap a "photo finish" at Lexington&apos;s Thoroughbred Park, Main and Midland streets, where realistic, life-size bronze horse statues race and graze. 8. Do some water-watching (and people-watching), day or night, in front of the cascading wall of fountains at downtown&apos;s Triangle Park, corner of Main and Broadway. Or stop at the unique fountains in front of the courthouses on North Limestone for more water wonders. 17. Drive or bike along Old Frankfort Pike (KY 1681), officially designated one of America&apos;s Scenic Byways. 29. Ponder Lexington&apos;s Civil War-era history on the grounds of the newly restored Fayette County Courthouse, where you&apos;ll find Cheapside Park, site of one of the South&apos;s largest slave markets. 32. iPhone and Android users can download the free LexArch Tour app. It guides you to 13 points of historic and architectural interest in downtown Lexington. 34. Enjoy the fruits of a lesser known Kentucky tradition: winemaking. Central Kentucky was the site of the very first commercial vineyard in the United States. Tour nearby Talon Winery (859-971-3214), Equus Run (859-846-9463), First Vineyard (859-885-9359) and more! 40. Meet at Kentucky River View Park landing and take a pontoon boat down the Kentucky River for a unique perspective on Frankfort and its history. The boat seats 10. Call (502) 229-1887 May through October. 42. View military history in a more personal light at the Kentucky Vietnam Veterans Memorial, a sundial memorial to Kentuckians killed in Vietnam. The point of the gnomon&apos;s shadow touches each veteran&apos;s name on the anniversary of his death. Vernon Cooper Drive, Frankfort. 46. Discover bridges to the past: Drive across one of Kentucky&apos;s 12 remaining covered bridges, the Colville Covered Bridge, on KY 3118 northwest of Millersburg. In Fleming County, northeast of Lexington, you can admire not just one, but three, lovely old covered bridges. 48. Stop in at Mims Retirement Haven in Paris and visit with retired celebrity Thoroughbred broodmares. Visit with great ladies of the industry like 1997 Breeders&apos; Cup Sprint winner Elmhurst. 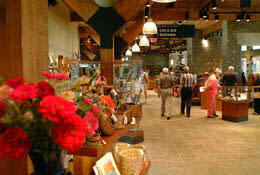 There are friendly guided tours seven days a week. Call (859) 227-6304 for an appointment. 70. Join in the fun of literally hundreds of free special events throughout the year, ranging from arts fairs and parades to harvest festivals and Christmas singalongs; contact the Lexington Visitors Center to find out what&apos;s going on while you&apos;re in town. (859-233-7299 or 800-845-3959.) 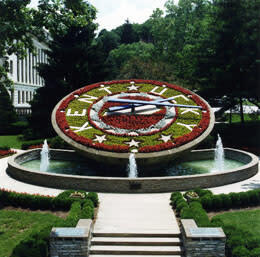 Or take a trip to www.visitlex.com. For more information contact VisitLEX, the Lexington Convention and Visitors Bureau at (800) 845-3959. Written by Teresa Day, a freelance writer based in Lexington, Kentucky.